Gaps in my children’s homeschool education don’t concern me. I hear homeschoolers express fear over the dreaded “gaps” in their child’s education all the time. It’s all over the internet, particularly rampant among newbie homeschoolers. But veteran homeschoolers are living in this fear as well. I don’t care what curriculum you use or what school you put them in. There is NO WAY they’ll come out without having missed something. Especially nowadays, when new things are being learned every flippin day! But now I can hear the argument…”But Tina, I’m not worried about them learning EVERYTHING. I’m just worried about what they ‘should’ know!” I’ve actually covered that argument at length in my article “Are They Learning What They Should?” that I wrote years ago. What constitutes a “quality” education depends on who you’re talking to or about. Just like beauty, education is in the eye of the beholder. Even among education “experts” there are many conflicting opinions on what children “should” learn at what ages. There isn’t some magic educational formula of subjects that will produce exactly what every child needs to get the best start in life and be fully prepared for their future. It DOESN’T EXIST. Stop stressing yourself out by thinking it does. Julie at Homeschooling-Ideas says it very well in her article “Education in a Box?” Education can’t be put into a box! The problem with thinking there’s a “right” way or worrying about a “gap” is that you are then making decisions based on fear. And homeschooling out of fear is not a good thing. In fact, this excellent article talks about it being “The Worst Reason to Homeschool”. You spend your time WITH your kids, being both physically and emotionally WITH them, learning WITH them, enjoying time WITH them, filling both their lives AND yours with a multitude of enriching activities. It’s something that’s damned hard in this day and age with all the distractions. And it’s especially hard if you, as a homeschool parent, are constantly thinking and stressing over what else they “should” be doing, and what is “supposed” to be done next, how far along you “should” be in curriculum x, and what else is on your long list of assignments for them. If you are present with them, enjoy learning WITH them, then you will notice what sparks their interest and what turns their fire for learning ON. And then, only then, can you choose activities and materials to share with your kids that will create their best learning environment. STOP and think about what you want for your kids. 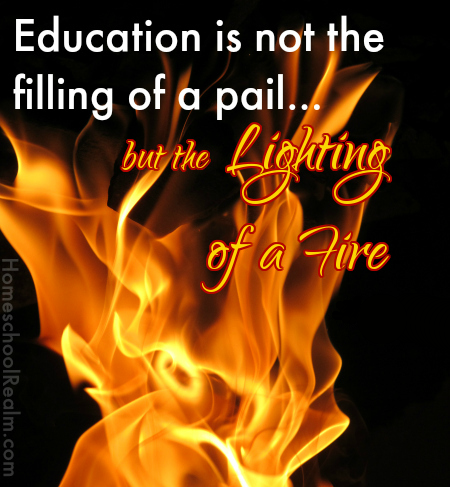 What is the end result you are hoping to produce with homeschooling? I think most of us want emotionally healthy children that enjoy life, are successful, and love learning. But we sometimes forget this in our fear of what they might be missing or our constant drive to pour more info into their heads. I’m NOT saying there’s no place for structured learning and curriculum! But don’t let your fear or your drive to fill your children’s days with the “best” curriculum and your idea of what they “need” to know before they reach a certain age cause you so much work and stress that you cannot enjoy the ride right along with them. Because your journey, along side them, is every bit as much a part of their homeschool experience as what the children get out of it. And it actually serves 2 purposes: Being present with them in their homeschool experience forces you to pay close attention to what works and doesn’t work for your kids, and it models that learning is a lifelong thing. What it all boils down to is– Gaps will happen…accept that, don’t stress over it. Because then they’ll fill in their own gaps. Love this! Exactly what I needed to hear (or read, in this case). Thank you for all the inspiration.